Did you struggle with acne as a teenager? If so, your mother or another well-meaning adult may have told you to stop eating chocolate, potato chips, or some other type of food to help clear up your skin. Then the conventional wisdom shifted and said that the state of your skin had nothing to do with your diet. I'm sure you know by now that this is not entirely true. Your diet affects your body, including your largest organ — the skin. Still, new research indicates that there's probably not any one food that will trigger a breakout. However, the overall quality and combination of foods you eat are likely to influence your skin. A study recently published in the Journal of the American Academy of Dermatology focused on a number of dietary factors that the researchers suspected could affect acne. They evaluated a total of 50 patients with acne and 36 control participants without acne. In particular, the researchers measured their dietary glycemic index, glycemic load, milk consumption, fasting glucose, insulin, insulin-like growth factor, insulin-like growth factor binding protein, adiponectin (a protein that regulates glucose levels and breaks down fatty acids), and a homeostasis model assessment of insulin resistance values. The researchers found some significant differences between the participants with acne and those without. In particular, the acne patients had much higher glycemic index and glycemic load levels and much lower serum adiponectin levels. As you might expect, there was an inverse relationship between serum adiponectin and glycemic index levels. This research clearly indicates that eating a diet high on the glycemic index can be correlated with acne, and the researchers suspect the low levels of adiponectin are contributing to the pathogenesis of the acne. What's more, this can last your entire life. So if you're struggling with acne, it's worth evaluating your diet to see where you may be consuming too many foods high on the glycemic index. You can start by swapping any products made with white flour for whole grain versions, and make sure you're consuming plenty of vegetables. And you probably should cut back on the chocolate and potato chips – Mom got it right on this one, even if her science was a little off. You can also help get your glycemic load to a healthier place by taking Advanced Blood Sugar Formula. It supports healthy blood sugar and insulin sensitivity, so it's great if you're trying to avoid diabetes and other blood sugar issues as you age. 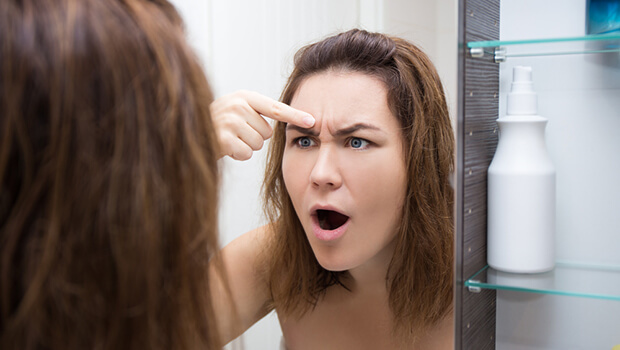 Now this research tells us that acne may be one of those blood sugar issues, giving you yet another reason to ensure you keep your blood sugar under control.